Isuzu Trucks has been a leader in the Australian truck market for 28 years and today about one in every four new trucks sold in Australia carries the Isuzu name. 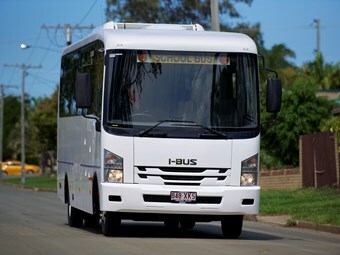 In terms of buses, the I-Bus is a relatively new concept to the Australian market. Uniquely, it is built on the Isuzu truck drivetrain and chassis, making it a very strong bus. I met with I-Bus Australia sales consultant Craig Marshall to learn more about this vehicle and give the 500 Series a drive myself to see just how these tough workhorses handle. "I-Bus is basically Brisbane Isuzu, a franchise of Isuzu Trucks; there are 53 Isuzu dealers around the country that are individually owned and operated. The I-Bus side of the business only began about two years ago and the company just keeps growing, we are currently building and expanding a new showroom here at Burpengary to meet the growth," Marshall says. "We have three branches across Brisbane. All of the buses are sold out of this branch, but servicing is done at any of our branches." All the buses are built on an Isuzu truck chassis. The conversion is then completed, giving the buses all the strength and reliability of the Isuzu product. "Everybody knows Isuzu trucks and how good they are. With the front-mounted engines, they run cooler. For rural operators, a major advantage is the distribution of more weight over the front wheels, eliminating operational issues that commonly happen with rear-engine vehicles in difficult conditions." "We have four-wheel drive models that are being used to drive on beaches, do school bus runs out in the rough country, and they also do charter work," Marshall says. "These 4WD models range from 20-40 seats the larger model is an Isuzu FTS800, which is a 14-tonne GVM." The unique build process sees the Isuzu chassis completed here then leave Australia, travel to Malaysia and back. "The first part of the process is that we prepare the chassis – this part takes about a week – then the chassis is shipped overseas to Quality Bus and Coach in Malaysia. This takes about a week and a half," Marshall says. "They complete their end of the work and ship back so we can do all the Australian alterations and additions that are needed, like the bullbars and UHF radios or any other customer requirements. "Pre-delivery is done and then it’s ready to be shipped to the customer. This whole process takes around three to four months for something we haven’t got on the shelf." "Quality Bus and Coach have been building buses for a long time, they do excellent bodywork. They work on Scanias and Volvos and lots of different buses, so they’re very experienced. When the owner wanted to create I-Bus, they did lots of homework and Quality Bus and Coach were the best fit". For the distance travelled, the build time was better than expected, justifying the process as well refined and working successfully. "Basically the Isuzu chassis underneath is pretty much bulletproof, therefore when the customer purchases an I-Bus they are getting reliability, easy access to parts and a great servicing network Australia-wide," Marshall says. "Underneath you have the benefits of a truck chassis; some have been stretched or altered, but that part is done in Australia by our engineering division before it leaves. When we send a chassis, we know exactly what it’s going to come back as. If a wheelbase has to be stretched 500mm, it’s all done here before it leaves and we have full control over the chassis quality." No Isuzu vehicle uses AdBlue at this time, though the emissions are achieved through a DPD (diesel particulate diffuser). "It’s like a big filter system that traps all the soot and when it gets to a certain level it burns it into ash," Marshall says. "The filter needs to be cleaned only every 100,000km and we also use exhaust gas recirculation [EGR]. As a lot of our buses are used in remote country areas a driver doesn’t want to be looking for and AdBlue pump or operators having to have their own. "Since 2008 we have been using this technology, many companies are just getting into this technology now but Isuzu were ahead of the game." The I-Bus 500 test drive vehicle was fitted out as a standard school bus model. It’s made to be tough but the finish was higher quality than I expected. We drove around suburban Burpengary to have the bus in a standard school bus route environment, even though this model is made to handle much more rugged terrain. I would have loved to have given it a tough drive to really experience all that this workhorse is built to handle. The 500 is made to carry a heavy load so I expected the unloaded bus to be a bit stiff on the road, yet handling around corners and road manners were pleasant and smooth. The automated manual knows just what gear to be in, and I can see why I-Bus says most customers are leaning to this as the preferred option. I don’t know why you would go for a manual when this transmission changes like it does – with the option of the manual override. Glass visibility area for the driver is generous. With the front-mounted engine I expected cabin noise to be higher than it was. I found some hills and could feel that it certainly tackles them effortlessly with plenty of power from the 5.2-litre 4-cylinder engine and 205hp. Although the braking system worked effortlessly when unloaded, again you can feel all the benefit of the tough Isuzu drivetrain and chassis. Steering is light but you still get a good amount of control and road feel from the steering wheel. I had anticipated the drive to be more truck-like however I was pleasantly surprised with the ease of the drive. Overall I could find no negatives. This is an easy-to-drive, powerful vehicle and I think I-Bus is definitely onto a winner for a unique bus built specifically to tackle what the harsh Aussie outback can throw at it! It’s always good to see a company using local suppliers and service, so some components are home grown and most customers will definitely see that as a positive feature. Brisbane Isuzu does all the pre-delivery, including picking the vehicle up from the docks. Coach Works at Acacia Ridge does some of the modifications. Alternators all come from a local source – Rapid Rewinding, which places big 140-180-amp alternators before they leave. The Thermo King units on the buses need the more-powerful alternators, and Rapid Rewinding builds them locally. Air Bag Man in Brendale does a lot of the air systems for the smaller trucks that don’t come standard with air. Similarly, the I-Bus 450 and the 300 chassis don’t come with air, they are provided with compressors to run air bags and doors. "These modifications are also now being done before they leave as it is much easier to access at that stage," Marshall says. "The smaller ones have helper airbags. The original truck suspension is still under there but obviously on some trucks that can be quite harsh so we add the helper air bags. "We have a country pack available on our five-tonners, where we put a pair of driver-adjustable air bags on the front axle so, say they are coming to a washout that’s fairly rough, they can push a button on the dashboard and raise the front until they have passed the issue. "It’s just the option of a bit of extra clearance in tricky situations; this has been a new feature we have designed in the last few months." The lights are also from local suppliers, as are the bull bars, with Marshall saying local supplier Ultimate Bull Bars at Narangba "does a great-quality, air bag-compatible, high-strength, beautiful bull bar". These have to be tailor-made because the buses are wide. The buses all have their original truck air-conditioning along with the Thermo King systems. Therefore, if a driver is driving alone, they can use the existing truck air-con or switch to the larger system when passengers are aboard. "We know the Thermo King product when it comes to truck refrigeration and we know they have great servicing agents for our customers," Marshall says. The Isuzu chassis has the capacity to take a second compressor. A space is left beside the engine for this as it could also be used for truck refrigeration, so nothing has to be moved to have this added. Marshall mentions the brand’s focus on customer service, saying it’s all about providing the quality and the backup customers need, and that Brisbane Isuzu has been one of the largest dealers in Australia for a number of years now. "The parent company has been around for a long time and all of these promises and core values are things that we have as part of our daily business operations. They also play a large part in why we have a lot of long-term staff. "In terms of quality assurance, I have three buses I am picking up from the docks next week, they will come here already fully pre-delivered. We then thoroughly check them over again. "This process has already been done but we find a fresh set of eyes doing the pre-delivery a second time, top to bottom, ensuring what we are delivering to our customers is perfect. "When we deliver, we know that our customers won’t call us and tell us ‘I just found something’. We eliminate that possibility with the second check." That customer service extends to Marshall’s own line of duty. "It’s all about the customer. If there is an issue it gets sorted. Recently, a bus needed to be delivered urgently to Wodonga. "If you promise a delivery, you deliver the goods. I drove it down to the customer myself. I drove for 11 hours the first day, stopped with family at Sydney, then seven-and-a-half hours driving next day because I took a detour to drop off a manual to a customer in Crookwell. "That’s how I spent my long weekend, driving for three days, but that’s what you have to do to deliver what you say you will." Marshall adds that as customers use the buses, Isuzu gets feedback to adapt and continually develop the product. "Our conditions in Australia are different to anywhere else in the world so we are constantly developing the vehicles to ensure it suits the harsh conditions they are used in," he says. "Price-wise, we are mid-line on the Australian market – not the dearest but not the cheapest. The Isuzu chassis has outsold others on the Australian market for around 28 years. "Generally one in four trucks rolling out of dealerships is an Isuzu. Sometimes the price out the gate doesn’t really matter – it comes down to the running costs of the vehicle, lifetime economy, and resale value. "Customers look at the whole-of-life costs, and sometimes the cheaper alternatives end up not being the cheapest over the lifetime of the bus," Marshall concludes.